Discover the greater possibility of finding the way of life you want and love. Try something new. Discover things. Do what you’ve never dared to do. Be unafraid to mess up and fail. Everyone fails. Face your fear and vulnerability. Believe that everything will turn out well, despite the fear and uncertainty. Challenge yourself, to be able to explore and discover your full potential. Grab opportunities. Create one if you have to. Take chances. Take actions. Improve and to develop your leadership skills. Develop the power of discernment. To be able to follow your gut feeling. Be decisive and full of determination. Believe in your willpower and your strength. Invest in yourself, and be confident. Love, seek greater understanding, and be compassionate. Be relentless. If you want something or someone, go for it. Do not falter nor waver. Allow yourself to speak out, and let people know what you think. Have the courage to choose wisely. You owe it to yourself. 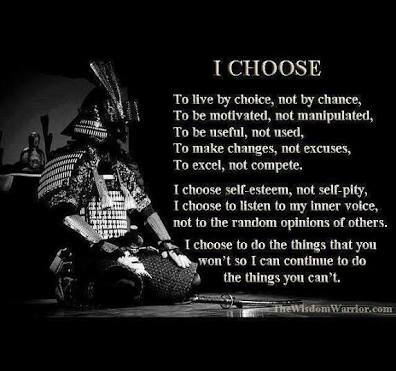 Choose to be in control of your life. Choose to focus on your goal. Choose to follow your heart.